The federal judge presiding over the case against former Trump adviser Roger Stone seems to be getting sick of his constant media appearances and has threatened the self-styled dirty trickster and his lawyers with a gag order. 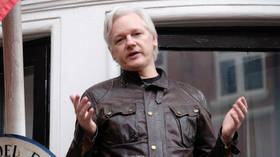 “This is a criminal proceeding, not a public relations campaign,” US District Judge Amy Berman Jackson said, condemning the frequent “extrajudicial statements by the defendant” while admitting she understood Stone’s desire to tell his side of the story. “You can talk about foreign relations, immigration, or Tom Brady as much as you want to,” Jackson said – just don’t talk about the case. The judge gave Stone’s attorneys and the prosecution a week to submit their written opinions on the proposed gag order. 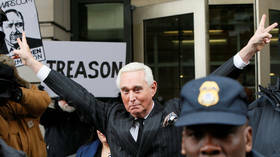 Stone has missed no opportunity to speak to the press since his arrest last Friday, appearing almost daily on Alex Jones’ Infowars show to discuss his case and booking an appearance on Tucker Carlson Friday night, following a whirlwind schedule of interviews with Reuters, CBS, NBC, and other outlets. Stone claims the FBI tipped off the CNN to his arrest – which would be flagrantly illegal – and says a neighbor saw the network’s news team arrive at his Florida home half an hour before arresting officers stormed in. CNN did broadcast the FBI raid on Stone’s home. 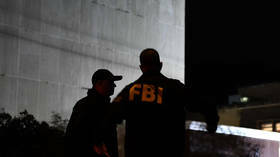 Several Republican lawmakers, including Rep. Jim Jordan (R-Ohio), Rep. Mark Meadows (R-North Carolina), and Rep. Doug Collins (R-Georgia), have written to FBI director Christopher Wray, demanding an explanation for the use of force during the raid. As Carlson pointed out, more agents were sent after Stone than Osama bin Laden. Senator Lindsay Graham (R-South Carolina), chair of the Judiciary Committee, called the arrest theatrics “over the top” during a television appearance. Stone pleaded not guilty on Tuesday to a seven-count indictment including charges of making false statements to Congress, obstruction of justice, and witness tampering stemming from claims he made about his knowledge of WikiLeaks’ plans to release emails damaging to Hillary Clinton’s presidential campaign. Predictably absent from the charging documents was any hint of proof of the elusive “collusion,” though that hasn’t stopped the media from claiming that – once again – the “walls are closing in” on President Donald Trump.